A large volume of any limestone is usually composed of carbonate mud or micrite. Because of the small size of the grains or crystals in the micrite, identification of their origin is difficult to impossible. The grain size boundaformry between sand and mud that is used by geologists for carbonates varies: for instance, Dunham (1962) puts it at .02 mm and Folk (1962) .004 mm. The fine grained carbonate sediment micrite may be precipitated chemically or biochemically from seawater, derived from the abrasion of pre-existing calcium grains, or form during disintegration of calcareous green algae (figure above). 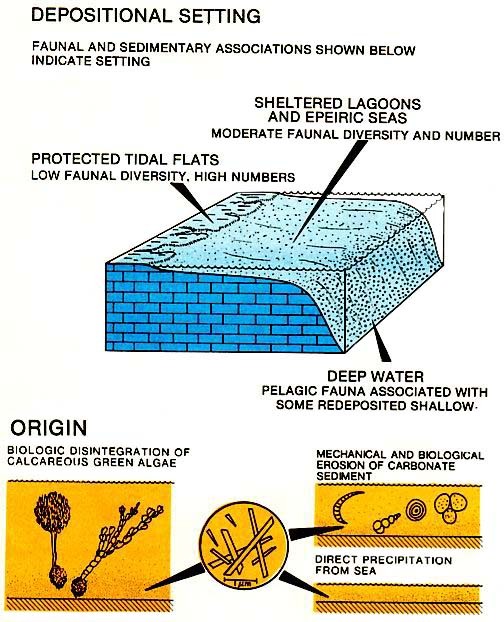 This sediment accumulates in a variety of settings: in the still water of protected lagoons, below wave base in deeper water, and even in agitated settings within and beneath the protection of algal mats. Should the presence of micrite be used to interpret depositional settings, then its vertical association with other lithologies and its faunal content should also be considered. Any interpretation is complicated by the existence of micrite-size cements, which may have a different distribution to that of fine sediments. The micritization of broken skeletal and non-skeletal grains, that is the recystalization of a preexisting crystal fabric to a micritic one, also adds to the confusion. This is because these micritized grains may be mistaken for fragments of sedimentary micrite. 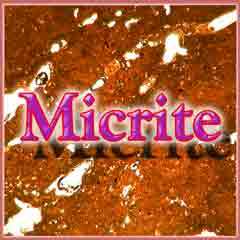 Micrite cement is discussed in the section on cementation and diagenesis.